Here we go again. I didn’t hear the English accent during the Grammys and I don’t get this new “screw you” in the Taylor Swift/Harry Styles feud. But what the hell do I know? I have the maturity level of a seven-year-old boy not a 13-year-old girl so little things like wearing a beanie cap in a music video because your ex-boyfriend wears one all the time get lost on me. But apparently that’s what Taylor did and everyone’s saying she’s ripping on Harry again. Poor kid. I almost feel bad for him this time – almost. He did mess with the bull and now he’s getting the horns. Taylor really is the female Kris Humphries. There’s no escaping her vengeful wrath! So let’s break this down. 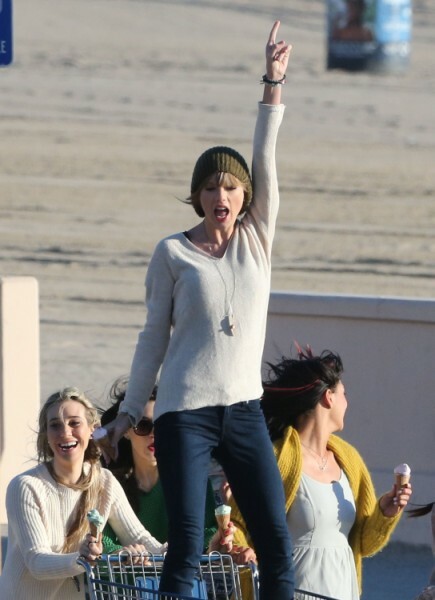 Taylor was spotted filming the music video for her new song 22 in Malibu this week. She’s doing her girl power thing and she just happens to be wearing a green beanie cap. Apparently Harry is always wearing a similar one to cover up his gorgeous tresses. Is it just coincidence or is Taylor going after him again? I’m on the fence. I truly don’t understand how a two-month relationship could incite this much angst but I know a lot of you out there think Taylor is very capable of dragging on the hate for a little while longer. Let’s assume she is wearing the beanie on purpose. Is it immature or just funny? Should she stop harassing the poor teenager? At this point I don’t care what the kid did, Taylor just needs to put on her big girl pants and move on. But Taylor’s no dummy. She knows we know about the beanie. She’s probably wearing it to get the song more attention… more play… more money. She’s good, very good. If I were Harry I wouldn’t feel angry or hurt at this point, I’d just feel used. Taylor’s milking their relationship for all it’s worth. Do you think the Taylor Swift 22 video is directed at Harry or are we just pulling hairs? Do you get the feeling he’s getting used by the Taylor Swift brand machine?